1.13 Port Status: Github Issue. More information here. TLDR: it's going to be a while. Continue playing 1.12.2 if you want mods. The version of AppleCore you are using must correspond exactly to your Minecraft version for this mod to function properly. Instead, health regeneration begins 10 seconds (by default) after taking damage, then rapidly (by default) regenerates health. This system is similar to what is done in some first-person shooters. The mod has been dramatically changed in version 2.0.0, so please read the wiki page for more information. This mod is for those who think Minecraft's hunger system is a little poorly-designed, with it being more of an annoyance than an interesting / fun game mechanic. ToughExpansion - ToughExpansion implements its own thirst-checking mechanism that is incompatible with Health and Hunger Tweaks. It can be disabled in its config file. More information can be found at the repository and the wiki page. Mod pack information: read the license, though the answer is most likely 'yes'. Also: don't expect me to read / reply to comments left on Curse. Please use the Github Issue Tracker for bug reports. If there's a crash, post a link to a pastebin of the crash-report found in the Minecraft folder. Give as much information as possible, such as logs, what you expected to happen, what happened, logs, images (if applicable), and logs. Use common sense as well. Finally: I may or may not be around to update this in the future, so if you feel like forking the repo and distributing it, that's totally fine by me. Just name it in such a way that it can be distinguished from the original (e.g. 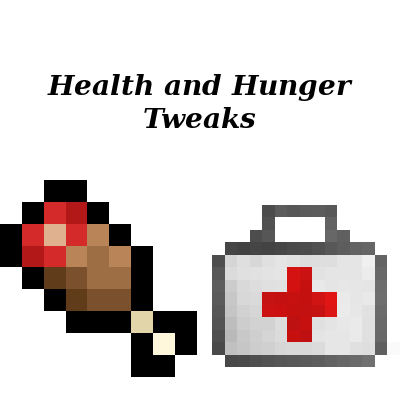 Health and Hunger Tweaks Reborn, or something like that). Hello, I am not sure what the best method for getting a hold of you is, so I am going with the everywhere method. I opened an issue report on the github. Thanks for the issue, for future reference I get emailed very soon after receiving a Github issue, but I only have my project's comments emailed once a day in a roll-up. hey ah, does the latest version work on 1.12? is it compatible with tough as nails mod? oh no, it isn't. TAN handles the health regen system. it's so sad :( please add support for TAN :( hope u do. Health and Hunger Tweaks now integrates with Tough as Nails in regards to minimum thirst. Thank you for the suggestion! Will we get a 1.11/1.12 update? there's another mod out there that does a very similar thing, after playing with it for a month or two, I've come to the realization that that one is painful to use, as the recipes for healing items are much, much more difficult to get, requiring entering into the Iron age, finding vines and cactus before being able to craft low end healing items, by which you will have died several times. Atleast with this one you don't need to rely on getting iron before you can start healing, nor do you have to click and hold a button to start healing. Can you port this mod to 1.8 and 1.7.10?There's a lot more mods that requires this mod to balance in these versions. Unfortunately, I make extended use of the Forge capabilities system to manage health kits and regeneration timing. Because this system was only implemented recently, it will require a rewrite of the code to be compatible with older versions of Minecraft, and I simply do not have the time at the moment to undertake such a task. Another thing I noticed, in the config there's an option to enable and disable the default minecraft hunger health regen, my only problem with that is that apparently you can't have the normal regen without the OP saturation regen. This is easy enough to fix; I'll try to have an update out tomorrow that fixes this. Sorry for the delay, I actually had a bit of trouble with the AppleCore events firing at strange intervals, so I couldn't do this right away. Additionally, I was exceptionally busy the last 2 weeks. I've actually decided to overhaul the mod, so watch for updates on Github and Curseforge. Alpha builds will be available shortly. Amazing mod, the vanilla saturation regen makes healing too trivial and fast. This mending thing seems too convoluted, there should be an option to have dynamic regen based on your hunger level. Like, full equals vanilla hunger regen(not the saturation one), then the regen gets slower and slower based on how much hunger you have left, giving no regen at all only when you can't run anymore. Also an option to enable/disable the crafting recipes for the health kits, as they might be unwanted with other mods that provide health recovery options. Thanks for the advice, I had actually been somewhat dissatisfied with the current mechanics, and had been stuck on coming up with a solution. I will definitely take your suggestion into consideration! Haha, technically true. Though, if you would prefer regular regeneration to still be on, there's a config option for that! It's B:disableRegularRegen under mending.